Shinobi in clear acrylic and Tsunami Alumilite section. 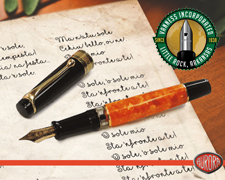 My 2015 guest post for On Fountain Pens "12 Days of Christmas". Thank you Maybelline for inviting me agin this year to participate in the 12 Days of Christmas. This is about my quest for a custom pen. I had never had a bespoke pen before and never gave it much thought. It started at the 2015 DC Super Show when i saw a lot of people who had custom pens tucked away in their cases between the Visconti’s, Montblanc’s Sailor’s etc. Not only were the bespoke pens unique but every one had a story behind them. I found myself drawn to the beautiful Shinobi by Shawn Newton. Leigh Reyes and Thomas Hall both had stunning examples. It was then I knew I had to have one. The Shinobi is a hand made pen created by Shawn Newton, the owner of Newton Pens. Each pen is made to the customers specifications. From the material of the body and section to the nib material and nib grind. You can even supply Shawn with your own nib and he will fit it to the pen. So who is Shawn Newton? Shawn, a teacher, started making pens back in December of 2011. After selling off every pen he owned to buy machines, tools and parts he used Kickstarter to help get the rest of the way there. Starting Newton Pens while teaching was a challenge but one he took head on. He pursued his passion until in 2015 he found it necessary to stop teaching and run Newton Pens full time. While doing both though, he started a scholarship fund to help students with college expenses. He continues this now even though he is no longer teaching. This is just part of who Shawn is and the dedication he has to helping those around him. The pen shipped in a thick box and in the box was a stainless steel travel mug that housed my pen. Talk about indestructible! What's nice is the travel mug, that has his logo on it, now goes to work with me in the morning. That's not all though. To protect the pen while in the mug it is put inside a handmade pen sleeve Shawn's awesome wife Elizabeth makes. I was pretty excited to see I got a Batman Sleeve. Lastly on shipping was that it was insured and needed a signature. This helps a lot in keeping the USPS honest. The Shinobi is a pen unique to Shawn and has become a very popular request. As well the queue to get one is long with an approximate wait time of 4 months. Closed it is a seamless barrel design with an impeccable fit and finish. Here's where it gets interesting. The barrel has a flat edge on it. That edge runs the entire length of the pen right through the cap. This allows you to place the cap down without it rolling away. You can also do the same with the pen since the flat side is also on the barrel. Lining up the cap and barrel so this flat spot stays true only takes a minute to figure out so you will be able to put the cap on every time with the flat sections meeting up. It is a brilliant and simple design that serves a true purpose. The overall balance and feel is very comfortable and fits my hand well. Do note that the design of the pen does not allow for it to be posted. While posting it is not necessary due to its length there are some who like to have a posted pen no matter how long it makes it. Material choices are limitless. While Shawn has plenty from Acrylic, Ebonite and Alumilite you are not limited to just those he has. Should you have your own material sourced he will use that if you like. While the cap and body are typically made from the same material the section can be another place to really make your pen stand out. With my Shinobi I chose a clear Acrylic for the cap and body with Tsunami Alumilite for the section. Clear acrylic adds another step of work to the process. Once the pen was made Shawn then had to spend over an hour just polishing the cap and barrel inside and out. Getting them to be crystal clear is a daunting task. It also means that the pen must be perfect. If any mistakes are made such as thread material not 100% smooth or even tiny scratches inside or out will be very easy to see. Special tools and techniques have been developed by Shawn to ensure the final product is perfect. There is no way to hide any mis-step when making a demonstrator pen. The filling system is a cartridge convertor that is supplied. It is a standard Schmidt converter that works well and is easy to clean. The other way to fill it is to "eye-dropper" the pen. This means you fill the body directly with ink. This increases you ink capacity from about .7mls to 4mls. When doing this you should put some silicone grease on the threads of the section where it goes into the body of the pen to help prevent any ink from leaking out. Shawn has made fine and precise threads here to help aide in doing this. Having a clear version of this pen gives the eye-dropper filling a very dramatic effect. Seeing all that ink sloshing around inside is really neat. I will note here that using a quality ink is important as you don't want to stain the inside of this pen. I used Iroshizuku and Akkerman with both cleaning out very easily. Nib selection is up to you. Shawn uses #6 size JoWo nib units that have his logo "N" engraved on them. I requested a single tone medium nib with cursive italic grind. It is smooth and wet with some nice natural line variation. You can choose from stainless steel to gold to your own nib you want put in. When using you're own nib you will want to review the feasibility of it with the pen your having made. Once you have decided what nib you are going to have you will also need to choose the grind. Of course you can leave the nib in its stock form of XF, F, M, B etc or Shawn will grind it to what you like. CI, Stub, Oblique and so on. Speaking of nibs there is yet another option. Shawn can make extra sections for a pen. Your extra section or sections can have a variety of nib sizes and grinds. This allows you the ability to simply change the section of your pen to have a completely new writing experience. An example would be a Waterman 100 Years nib I have that gives beautiful vintage flex. I want to have a section made so when I want to have a pen to flex I can continue using my trophy pen. Overall I am beyond excited about this pen. I am at the point where I feel privileged to own it. For me it is beautiful, well balanced, holds enough ink to write a book and is a bespoke pen made just for me. Should you decide this is a pen you want in your collection don't hesitate to reach out and speak with Shawn about your ideas. There are many other designs he makes as well. Pens that have clips and different filling systems as well. Piston fillers, Bulb fillers and button fillers. You are truly only limited by you imagination.